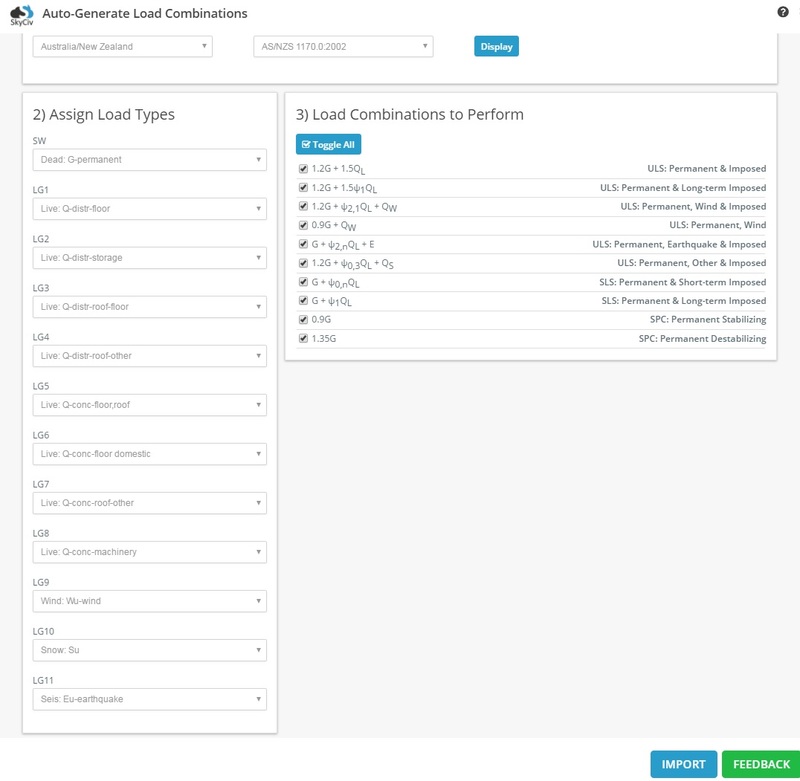 This article will focus on how SkyCiv’s auto generated load combinations feature meets the load combination equations as specified in AS/NZS 1170:2002. Ed,stb = [1.2G,1.5Q] Permanent and imposed action 1.2G + 1.5QL ULS: Permanent & Imposed. Ed,stb = [1.2G, Wu, ψc,Q] Permanent, wind and imposed action 1.2G + ψ2,1QL + QW ULS: Permanent, Wind & Imposed. The imposed action factor represented by the psi is determined by the type of QL that this equation acts against. Ed,stb = [1.2G, Su,ψc,Q] Permanent action, actions given in Clause 4.2.3 and imposed action. 1.2G + ψ0,3QL + QS ULS: Permanent, Other, & Imposed. The imposed action factor represented by the psi is determined by the type of QL that this equation acts against. Ed = [1.2G,1.5ψlQ] Permanent and long term imposed action 1.2G + 1.5ψ1QL ULS: Permanent & Long-term Imposed. The imposed action factor represented by the psi is determined by the type of QL that this equation acts against. The actions 4.2.3 relate to snow, liquid pressure, water and earth pressure effects. Appropriate combinations may include one or a number of the values for permanent, short term imposed action, long term imposed action, wind, earthquake or other serviceability values of other actions as necessary.